Although it appears to be made of distressed, weathered copper, it’s actually some sort of resin around an armature and I love it. 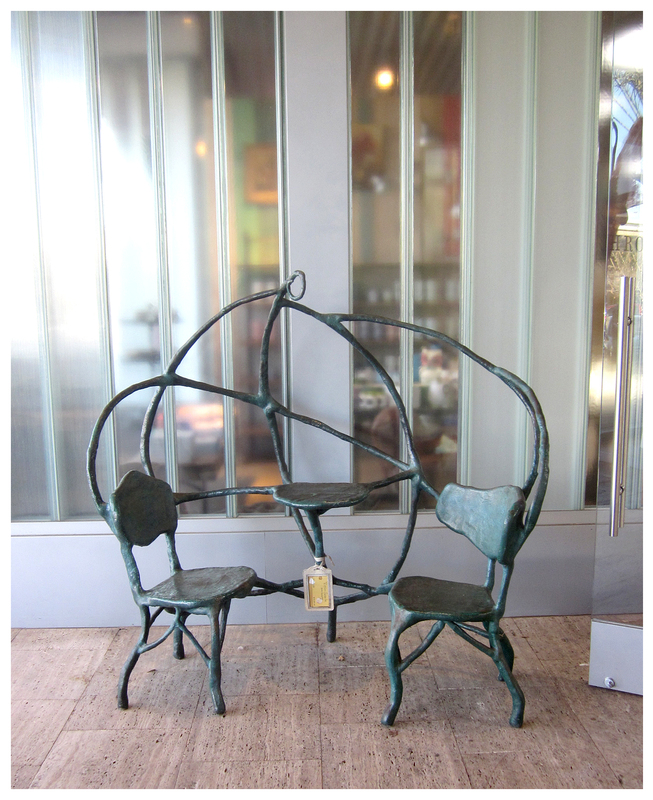 It’s the perfect garden piece for when Tim Burton and Helena Bonham-Carter drop by for tea. Unfortunately, only Mr. Burton or Ms. Bonham-Carter might be able to afford the $10,000 price-tag. Also in store in the children’s area: 3 three-legged molded fiberglass stacking stools in primary colors. Gorgeously distressed and attractively quirky. And marked at $680 — each. I know that Anthropologie sources these items from far-flung outposts but still, these prices are a little soul-crushing. Oh, well … I did pick up some great interior decorating books, groovy scented candles and an bright orange magnetized oven timer I love, so it wasn’t a total loss. 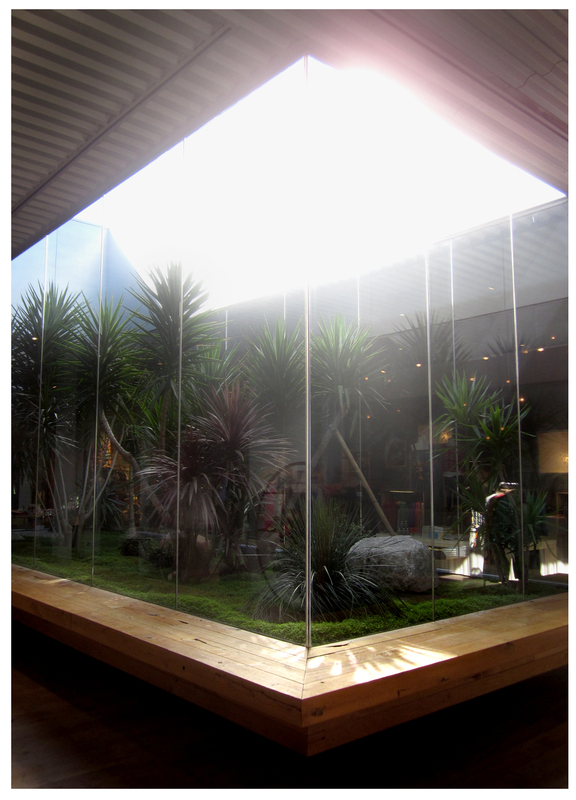 Plus, I did enjoy the store’s central atrium … planted with a soft carpet of baby’s tears, with spiked yuccas reaching for the light, it’s like a gigantic terrarium. The best part: taking a peek was free! 10 Grand?! With your talent, I’m sure you could make something comparable for maybe $75 to $125! Seriously, though I agree with Carol. Try making it!!! Thanks, Nisha for a great comment and terrific tip, I just watched the video on the garden’s site and it’s on the list … I’ll let you know when I’m in the neighborhood! This store is in Corona ?? Who knew ? Back in my day the only thing Corona had was smog . I can’t even find my other pants! The apparent scale of settee is confusing. I keep seeing it as being doll-house sized, thanks to the mullion in the window (looking like the line between two pieces of ridged glass) and the flooring – my eye is making those 3″ strips of wood, rather than the 30″ or something slabs of limestone. The only thing that actually gives scale is the door… The little loop on top doesn’t help matters – it’s perfect for hanging your miniature on the xmas tree!